Jonagold is high quality American apple, developed in the 1940s. As its name suggests, this is a cross between a Jonathan and a Golden Delicious. It is quite widely grown, and unusually for a Golden Delicious cross, is not limited to the warm apple regions, although it is not often found in the UK. Jonagold is a large apple, and makes a substantial snack. If you are struggling to eat your 5 portions of fruit and veg per day, this can help! 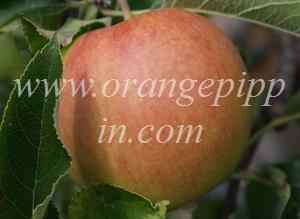 The large size is a good clue that this is a triploid apple variety, with 3 sets of genes. As a result it is a poor pollinator of other apple varieties, and needs two different nearby compatible pollinating apple varieties. 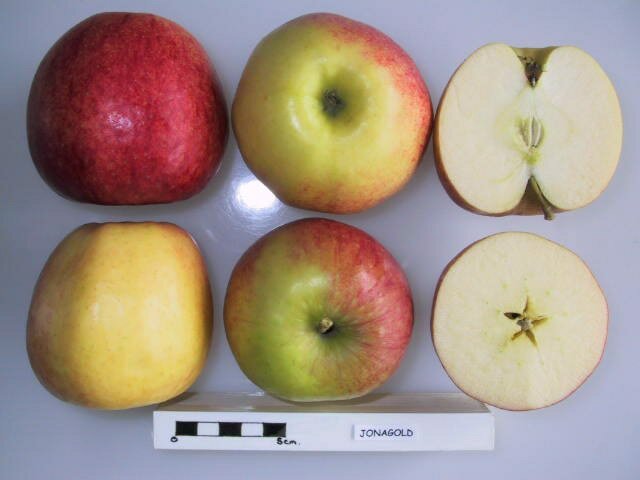 Golden Delicious is well-known as a good pollinator of other apple varieties, but cannot pollinate Jonagold. The colouring is yellow of Golden Delicious, with large flushes of red. This is a crisp apple to bite into, with gleaming white flesh. The flavour is sweet but with a lot of balancing acidity - a very pleasant apple. Jonagold's other parent, Jonathan, is an old American variety which was discovered in the 1820s. In the UK Jonagold sometimes appears in supermarkets in the spring packaged as "value" apples, often from Holland, and at a very low price. We are trying to find out more about these apples, but it seems that they are mainly "second" quality apples which are nearing the end of their storage life and are surplus to other uses. Jonagold is widely-grown by commercial growers, and there are a number of more highly-coloured sports. Jonagored is probably the most widely known of these. Others include: Decosta, Primo, Rubinstar, Red Jonaprince. Best flavoured apple I have grown so far. Yes it has scab here in Cornwall, but who cares, it tastes amazing. though prone to canker, only had one case on one branch in the last 9 years, so not that bad I thought. If i'd ever move, I would plant it again. I just Reid these for the first time today got them at the local girders store Super King for 89 cents a pound. They were amazing crisp ,juicy, and full of flavor! The best apple I have ever tasted in all my years! The people who complained these apples were soggy and tasteless are nuts ! They must haves not had a Janigold because these are amazing! I normally buy Gala apples at the grocery store and love them. Today I went to our local Farmer's Market to see if the apples were in yet. There were no Gala apples so I asked the vendor to recommend one of his eating apples that were sweet and soft and not so crisp. He pointed me toward the Jonagold. I had never even heard of these apples. I have to admit, these apples are very good! Everything he said they were. I will definitely be buying more of these delicious apples!!!! This is my favorite eating apple when it is fresh and my biggest disappointment when it has been offered after long storage in the grocery. I imagine that most of the negative comments are due to the cheap mistreated version of this great apple. I first discovered this apple while on a tour/field trip in my Fruit crops course at Co. State Univ. The orchard was at a fairly high elevation near Cedaredge/Paonia area. Picked right off the tree in September, and it was the best apple I had ever tasted, crisp, juicy, sweet (not too sweet), with a little tartness. I asked the grower why they were not more of them in the stores, and his answer was that they are not good keepers, and best if eaten within a month after picking. So I bought my own tree and have had heavy crops of large delicious apples for the last 15 years. We do not spray, so we get a little spotting and such minor imperfections on the outside, but just bite into one and you have a little bit of heaven. Western states which have hot dry days and cool nights, do develop a little more flavor, but for Western NC, it is an awfully good apple. Jonagold, where have you been all my life? I recently bought a bunch of these apples at the supermarket as they were on sale and the cheapest. I took a chance and am hooked! Beautiful, large, and ever so tasty & crispy. My other favourite apples are Mutsu and Empires and this is comparable. My favorite, favorite apple. crisp, juicy, firm, with some sweetness but not as much as honeycrips. Comparable to empires or mutsus in texture but sweeter. Cameo is very similar. It sounds from the comments like this is not worth it from a supermarket. But, if you can find a farm with them, I think they are fantastic. I picked some this weekend, and they are honey sweet, with a little bit of a bite. They are huge!! I can barely finish one. I highly recommend this apple if you like Honeycrisps, but wish they were sweeter. Mine were crisp, more sweet than tart, and just plain tasty. I wish they kept longer so I could have picked more! I agree with nearly every comment here. I have bought the best and not so best tasting apple every at the SAME STORE. Different batches...all depends on when their picked so I'm buying my OWN tree. The triple chromosome pollination factor worries me a bit but I figure it's worth a try. I've only tried the ones at the grocery store which were grown in Michagan. They were crisp and juicy, and a little on the tart side. I prefer those traits in an apple, but these really lacked in flavor, so I probably won't buy them again. Jonagold is one of those apples that can taste either extraordinary or no-so-special. It depends on where you get them. I've yet to taste a supermarket Jonagold that warranted the price. Sorry but they had little flavor. Now the ones I've bought from family owned orchards up in the Mount Airy/Frederick area were phenomenal: crisp, juicy, dense, and good strong apple flavor complemented by a subtle pear-drop sweetness inherited from Golden Delicious. The overall tasting experience is a mouthful of fruity goodness. Now is it as good as Jonathan? Hard question because it will depend on what you are looking for in an apple. Jonathan's have an intense apply flavor combined with a rich spiciness that is lacking in Jonagold. B-U-T Jonagold has more complex fruity flavors. Personally I prefer Jonathan, but I usually buy both when given a chance. Both do well as cooking applies but I prefer Jonathan for pies. For the home gardener Jonathan is also better because the size of the tree is more manageable and it is partially self-fertile. Jonagold will require a pollinator. Blech! I got two of these from Lucky supermarket. They were terrible. Soggy and tasteless. And yes, they were really waxy. They weren't cheap either. Cottony and unremarkable. One bite and I'm done. They're on sale everywhere, ALL THE TIME - the mark of a variety ruined by volume apple growers who need red, easy to ship apples. Recently I found that Jonagold (or ??? in Chinese) are grown here in the northeast of China. No cheaper though than other common varieties such as Fuji or Gala. They are fairly large, yellow with red stipes, quite attactive fruit. Flavour is bittersweet, but more sweet than bitter. The skin has a nice stong apple smell, but an unpleasant waxy coating. Is the waxiness common? Purchased these at Richard Bros near Jackson Ohio. Extremely large and juicy this year. We usually prefer golden delicious, but as we were late visiting, this was a super replacement. They are thin skinned and quite juicy, and we agree with the tasting notes. Our were 50/50 blend of yellow and red. Got couple from an Asian grocery store who gets them from NY orchard. Very crisp and nicely flavored. I liked the balance of sweetness and tartness as I usually had it as dessert after meals. I am not sure if its due to their large size, but I felt that the apple was juicier and overall just better when served in slices rather than eaten whole. I hope to go back and get couple more if they're still there. My new addiction!! I just discovered these apples while apple picking, and OMG - the best ever! A wonderful infusion of sweet and tart. Perfectly crunchy! They filled the majority of my sack! I brought a few to work, now all my co-workers want IN!! When this apple is good, it's one of my favorites, as good as any apple I've tasted anywhere, but sometimes it's mediocre, mostly thanks to when they're picked and how they're stored and displayed by the wholesalers and grocers, I'm guessing. They also seem to come in different strains. One is larger with a more golden and a little rougher peel, not quite russeted, which goes mealy a little quicker than the other strain which has a smoother peel and is slightly smaller, crisper,redder, and has a better balanced flavor. In Frank Browning's book "Apples" written in 1999, Jonagold was the most planted apple variety in Europe at the time it was written, which probably explains the low prices some of you have seen over there. I was very proud to hear this delicious apple that so many people love was created at Cornell University. Bo - tastes like a direct cross between a Red Delicious and a Golden Delicious. I think it misses the mark as it lacks the honey flavor of a golden delicious delicious and the crispness of a red delicious. Brent- A big apple with a somewhat crisp finish. Not as sweet as some dessert apples. Actually the most delicious apple when picked fresh from the tree (Ontario, Canada). I am surprised by the lack of flavour reported by some reviewers, my guess is either the apples weren't fresh or the soil/climate is it ideal for flavour outside NE North America. Totally love this apple! One of the bigger dessert apples. The Jonagold is my current addiction. When they are in season, there is nothing I'd rather eat. They are sweet, have a hint of tart, are crispy and firm. I am in search of an opposite season apple because during the 6 months I cannot find Jonagold, my apple consumption drops off precipitously. Well I agree its not the best tasting apple, but its fantastic value for money especially considering the large quality fruits. At my supermarket they are 5 times cheaper than Jazz or Fuji (my favourites). They are juicy and I like the texture - but poor flavour. I must be honest, I didn't like this apple. The taste was wonderful, but the texture of the flesh threw me. I like my apples very VERY crisp, and it just didn't live up to my standards. A very good apple taste-wise though. I recently found Jonagolds at a regional grocery store and bought them because they were big, and they had a special. Little did I know that I was about to bite into the best apple I've ever had. Great to eat with peanut butter (chunky!) and great plain too. I love the taste where it's not too tart but not too sweet. The only problem is, most stores don't carry them! The absolute worst apple variety available on the mass market. They always look beautiful, but taste of nothing. I'd rather go without apples than eat Jonagolds. Our local Costco sells them from PA. Apples from the US northeast are the best d/t the climate and limestone soil imparting excellent flavor. Jonagolds are a perfect combo of tart/sweet and firm but juicy. There only weakness is they soften a little faster if not refigerated. I've a tree growing them -but I think someone took the first dozen or so. Not surprised. Our botany class has an apple tasting each semester. For fall 2010, this was the clear winner--crisp, juicy, sweet and tart. Seldom disappoints! An excellent apple. I grow several strains. For baking by far the best is Jonaprince. It's flavor is tops! I am planning of planting a new apple tree to replace one that I have lost. I have heard a lot of good things about the Jonagold Apple. I am looking for an apple that is good eating as well as a good cooking apple. Am I on the right track? I would be interested in your comments. Regarding the cheapness in supermarkets, I offer two possible explanations: 1. They are often irregular in shape and size. This devalues them in the eyes of the big retailers. 2. I've noticed that the supermarkets where I shop only put out one small box at a time. This makes me wonder if retailers are using it as a loss leader to reduce their average per/kilo price of apples. At a farmers' market they selling a multitude of different apples and as I eat an apple every day I was drawn to the one I'd never heard of. I bought a bag of Jonagold. A taste bomb, it is crisp, juicy a big. The best ever. By far the best tasting apple I have ever tried, very similar to the apples I used to eat off my nans tree about 45 years ago I never knew what sort they were and have never found any as nice since until now these taste exactly the same, gorgeous. What does Rob Barlow use to pollenate his Jonagold? I have bought these apples down at Geeveston,a cold area in southern Tasmania.I love anything and everything apple and thes are without doubt the best apples I have ever eaten. I'm passionate about apples, and on holiday this October in Macedonia I saw huge crops of Jonagold, Golden Delicious and (a few) Jonathans and Galas being gathered in. I had no idea that Macedonia was a major producer, as the only Jonagold I've seen in the UK have been Dutch, but apparently Macedonia exports mainly to the Gulf States ! I bought Jonagold for the first time as I'll always try a variety I've not seen before - and they were (still are) amazingly cheap. I like them a lot, I enjoy their crisp, slightly orangey sharp/sweetness, their juiciness and the fact that they are good "keepers". Other favourites Egremont russet, crisp cox (there are always some disappointingly soft ones), new season Discovery, James Grieve, Kidd's Orange. I have never liked apples or even apple pie because I didn't like the taste or the peeling of an apple, then I tried a Gala Apple because of thin skin it was a winner with me. One day while shopping for some apples, I saw a JonaGold and decided to try it. The color was striking and the taste was out of this world, it is by far the best tasting apple ever. I eat one everyday and will be sad when the season is gone I have become addicted to them. The price is a dollar or two cheaper than the rest, but I like that. An apple that is the best tasting ever at an affordable price is a WINNER. The best tasting apples. Very crisp and aromatic. You can notice the fragrance right away when you cut them! There are a sport of Jonagold - "Decoster", with a litle more acidic taste - superior! Half the price of other varieties. Firm, slightly acidic flesh. Best peeled and sliced into segments with a touch of sugar, rather than eaten whole (and I'm not a sweet-tooth). Big enough to make a good baked apple by the looks of it. Fear not, folks: this variety has been sold Stateside for decades with very few problems and has origins in one of the oldest apple growing regions in the nation. My guess is the ones you are eating are direct from the farm, so you should be fine. Undoubtedly the best tasting apple I have ever tried! My only problem is they are difficult to find in my area. If you like a crisp firm apple the is slightly sweet and tangy at the same time, try these!! I've had similar concerns to those of Cliff, does anyone know why they are so cheap? I agree with your tasting notes but what worries me is why they are so extremely cheap in s/markets, viz. 27p per kg against 63p per kg + for most other varities. Are they stock-piled somewhere in the EU? Are they as safe to eat? Are they subject more to pests & subsequently sprayed heavily? I would be grateful for your comments. Thanks. This apple variety was created at Cornell University. Rated as susceptible - control usually needed where CAR is prevalent.